Have you ever wondered why one year you get a great harvest and the next year your harvest is smaller and your plants didn’t look quite as healthy? You’re not alone! There is a logical explanation behind the change. It has nothing to do if whether or not you have a green thumb and everything to do with the fact that you’re not rotating your crops. Believe it or not, some historians believe crop rotation has been around since 6,000 B.C. Let’s just say, for a very long time. Simply put, crop rotation involves dividing the garden into sections and planting a different plant family in each section every year. This technique has been proven to keep your soil healthy and fertile, control plant disease, and reduce pests in your garden. It’s important to prevent crop-specific pests and diseases from building up and carrying over from one season to the next in the soil. If you move the crop, the problem has no host on which to live. Ideally, rotate your crops so it grows in a particular spot only one year and won’t be back to the same spot for three to four years. Make a list of vegetables you would like to grow this season. Next, let’s divide our crops into 4 groups; leaves, fruits, roots, and legumes. Leaves – These leafy greens thrive on lots of nitrogen to grow strong leaves and stems but nitrogen is the hardest nutrient to keep in the soil. That’s why they follow the nitrogen fixing legumes in rotation. They include cabbage, broccoli, cauliflower, kale, Swiss chard, lettuce, spinach, and corn (since it needs a lot of nitrogen). 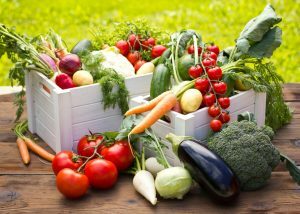 Fruits – This large group includes tomatoes, eggplant, peppers, squash, cucumbers, summer and winter squash, pumpkins, gourds, cucumbers, and melons (including cantaloupe and watermelon). All of these plants are heavy feeders, meaning they remove a lot of nutrients from the soil. That’s just one reason you don’t want to plant them in the same place two years running. They need phosphorus to set blossoms and develop fruit, but shouldn’t get lots of nitrogen or they’ll make leaves and no fruit. Technically, corn is a fruiting crop but we put it in the leaf group since it needs a lot of nitrogen. Roots – Carrots, turnips, parsnips, onions, garlic, beets, and radishes are all root crops that need potassium but don’t need much nitrogen. It is a good idea to grow root crops after hungry crops, since the root family tends to be a good nutrient scavenger and can be grown in comparatively poorer soil than other crops. Potatoes are root crops but I plant them with the legumes. That’s because they’re members of the nightshade family and suffer from the same pests as tomatoes, peppers, and eggplant, so I don’t want them to follow the fruits. They seem to suffer a lot more pest damage when they do. Legumes – Beans and peas enrich the soil by adding nitrogen. They have nodules along their roots, which allow them to absorb nitrogen from the air, and then release it into the soil. Now that your crops are divided we can now start planning our garden. So, imagine your garden separated into four areas. Each consecutive year, you would move each group one spot clockwise. So, for example if you planted your legumes in Area 1, then the next year you’d move them to Area 2, while the leaf crops from Area 4 would move to the now-vacant Area 1. 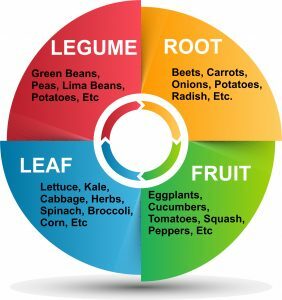 This rotation also takes into account nutritional needs: leaf (nitrogen), fruit (phosphorus), root (potassium), and legume (fixes nitrogen). In this system, the leaf plants go where legumes were last year, because legumes fix nitrogen in the soil, and leaf plants need large amounts of nitrogen. The fruits follow the leaf plants because they need phosphorus, and too much nitrogen causes them not to have fruits. The roots follow the fruits because they need potassium and need nitrogen less than the fruits. Finally, the legumes follow the roots to put nitrogen back into the soil. Adjust this method to best fit what you grow in your garden. Even if your garden is smaller, it may be a bit more challenging, but even minimal rotation will make a big difference. Just realize that it may be a bit more difficult to prevent diseases from spreading from one section to another, so you’ll want to keep a close eye on your plants and soil. In raised beds, if your planting mix is changed out every two to three years, then crop rotation is less important. Don’t forget to improve your soil along the way! You still need to feed your plants with all the good stuff like compost, manure, organic matter (grass clippings, leaves, etc. ), Soil Activator, and Town & Country Gardens Fruit & Flower Food.